Cult TV series Game of Thrones is to get its own 24/7 Sky TV channel this April ... in Germany. 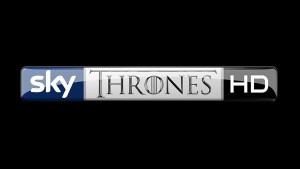 Sky Deutschland is launching Sky Thrones HD, available from 10th to 26th April 2015, which will broadcast all episodes from series 1-4 around the clock. On the 13th and 20th April, Sky Thrones will offer German viewers the opportunity to watch the first two episodes of the original English language version of series 5 at 21:20 CET, followed by Sky UK's new offshoot show Thronecast. From 27th April, GoT returns to the German version of Sky Atlantic, where the fifth series will make its German language premiere (two weeks after the UK premiere), but with an English audio option. But Sky subscribers in Germany with Sky Go can continue to follow the English language version at 'HBO pace' from 4am CET on Monday mornings. In the UK, the fifth series will be available from 13th April 2015 on Sky Atlantic, via Sky and its internet streaming services Sky Go and Now TV. ...part of an occasional series of articles featuring developments in Europe of interest to UK readers. This is where the UK 'watershed' spoils things for us, unless Sky start using the pin service on its other channels. Until then, we'll never get channels like this.